The first full reckoning of what actually happened at Abu Ghraib prison-"one of the most devastating of the many books on Iraq" (The New York Times Book Review) A relentlesly surprising and perceptive account of the front lines of the war on terror, Standard Operating Procedure is a war story that takes its place among the classics. Acclaimed author Philip Gourevitch presents the story behind a defining moment in the war, and a defining moment in our understanding of ourselves- the infamous Abu Ghraib photographs of prisoner abuse. Drawing on Academy Award-winning filmmaker Errol Morris's astonishing interviews with the Americans who took and appeared in the pictures, Standard Operating Procedure is an utterly original book that stands to endure as essential reading long after the current war in Iraq passes from the headlines. 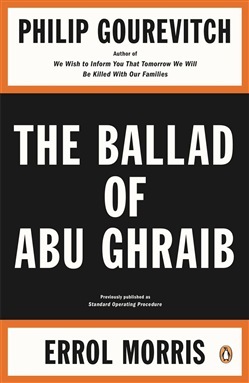 Acquista The Ballad of Abu Ghraib in Epub: dopo aver letto l’ebook The Ballad of Abu Ghraib di Philip Gourevitch, Errol Morris ti invitiamo a lasciarci una Recensione qui sotto: sarà utile agli utenti che non abbiano ancora letto questo libro e che vogliano avere delle opinioni altrui. L’opinione su di un libro è molto soggettiva e per questo leggere eventuali recensioni negative non ci dovrà frenare dall’acquisto, anzi dovrà spingerci ad acquistare il libro in fretta per poter dire la nostra ed eventualmente smentire quanto commentato da altri, contribuendo ad arricchire più possibile i commenti e dare sempre più spunti di confronto al pubblico online.